ZeroHedge: Investing in White Gold! China circa 2008… six babies die from severe kidney damage while another 300,000 suffer kidney stones. As it turns out, melamine isn’t meant to be in infant milk formula! The result was a few Chinese businessmen taken out back and shot, literally… and a nation that, for good reason, doesn’t trust the dairy industry (for starters…). 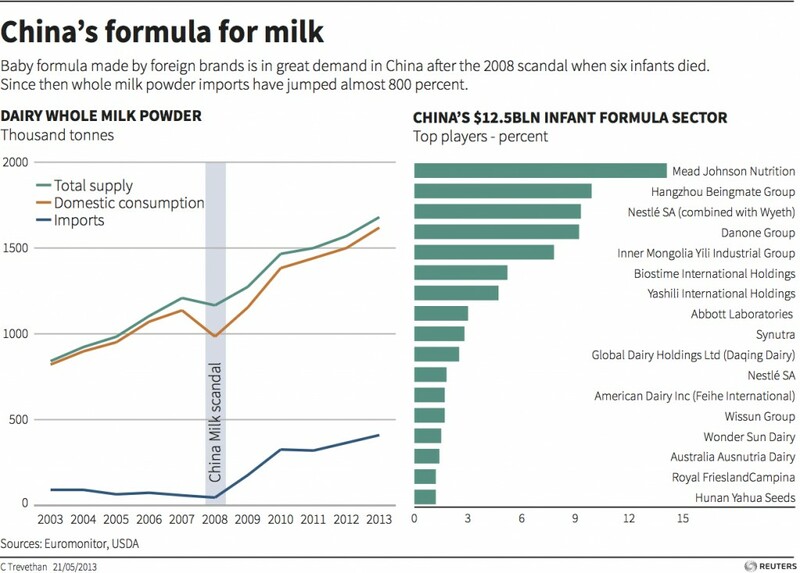 Since then China has “enjoyed” multiple infant formula scandals, including formula containing aflatoxin, a known carcinogen, and a scandal involving milk powder containing mercury. Outside of infant formula, but remaining on the topic of food found on Chinese supermarket shelves, it’s also possible to buy “glow in the dark” meat. Turns out bacteria-laden pork does that. I figure there may be a market serving it in night clubs, instead of glow rods you could have “glow kebabs” – call it theme food. Rice containing cadmium. A heavy metal which destroys your internal organs and causes cancer. Not a great ingredient in food methinks. Rat, Fox and Mink meat sold as Lamb. Come on…let’s face it, most any meat deep fried and doused in sufficient amounts of soy sauce tastes pretty much the same anyway. 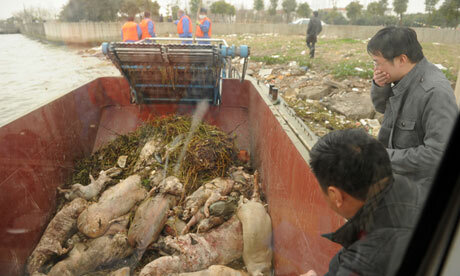 Dead, diseased pigs sold as food. This was stylishly referred to as “swine gate”. Turns out the pseudo-rabies virus in the pigs doesn’t gel well with humans. Deep fried with a bit hoisin sauce and it’ll be alright, no? In short, buying food off a supermarket shelf in China is a high risk adventure sport. What the average man may risk on his own behalf, he is far less likely to risk on his precious spawn. Those reading this article who have loved ones, especially children will likely agree with me when I say I would NEVER let my kid so much as look at any infant formula originating out of China. Even if there is a statistically small chance of poisoning, the ultimate penalty is death. Yeah, thanks, but no thanks! It appears many Chinese parents feel the same way, which has led to mainland Chinese buying infant formula in bulk from Hong Kong, Europe, the US, and Australasia, thereby prompting a rationing in some countries by companies such as Danone and Mead Johnson Nutrition Co. In a move reminiscent of US anti-drug trafficking efforts, the Chinese Government, exhibiting the intellectual capacity of a stuffed bear, have since restricted imports to just 2 cans per person. This has opened up a massive smuggling opportunity. You know the world is a screwed up place when transporting something so innocuous as infant formula is a punishable crime! Hong Kong border officials last year arrested more people for smuggling baby infant formula than they did for heroin! Markups now exceed 100% above retail prices in Europe, Hong Kong, Australia and New Zealand. When you consider I’m talking about the retail price and not the wholesale price, those of you who are not asleep, stoned, or dim, will quickly realise the obscene profits that smuggling generates. The average Chinese newborn consumes 22,630 grams of formula in their first 6 months of life, equating to a US$1,544 retail value. Demand is overwhelming supply right now. When a market accepts and trusts people whom they don’t know from Adam, selling infant formula out of their garage, then you know you have a market ripe with opportunity. Done properly the potential exists to create a powerful “trusted brand”. At present 70% of the imported infant formula market is controlled by foreign brands, with most of the independent brands run by small “Mom and Pop” companies from NZ and Holland, who as far as our analysis shows are successful mainly due to their product coming from “safe” jurisdictions. None we’ve found have strong marketing or endorsement programs, or are taking advantage of this opportunity in a well thought out manner. Mark and I, along with our CPAN members have recently completed a “friends and family” seed financing round in a company seeking to change this. Using a strong marketing platform they will seek to establish themselves as a niche, high-end supplier of infant formula to the China market. I’m here in NZ, and I just met with the CEO who is sourcing supply from a boutique New Zealand dairy company. He commented to me, “you know I wouldn’t know what to do here in NZ, all the problems seem to be solved.” This is exactly what excites us about emerging and frontier markets. There is NO shortage of problems, and the greatest profits always go to those who solve problems. We believe this company is in the right market, has a solid strategy which they are systematically executing on, and most importantly they have a very well-established team of professionals with solid track records of operating in China. Those factors, combined with a compelling valuation, are some of the reasons we got involved. As mentioned on our blog numerous times, we ALWAYS bet on talented, proven management first and foremost. By doing so we think the odds are stacked more in our favour than otherwise. Executed well, the rewards in this sector promise to be substantial. What is a sure bet is that someone in this space is going to make a fortune. We have placed our bet, now let’s see how it plays out. Time will tell, and nothing in private equity is ever a sure thing. However, I’m always cognizant of the deals which have vaulted my own portfolio, and most have had the ingredients of this one. We’ll likely introduce readers again to the company in question once they hit cash flow, but prior to going public. This article was posted in Australia, China, Hong Kong, New Zealand, None, Private Equity. Bookmark the permalink. Follow comments with the RSS feed for this post. Both comments and trackbacks are closed.